This fishing shirt is a light 4.2 oz 52/48 polyester/cotton poplin. 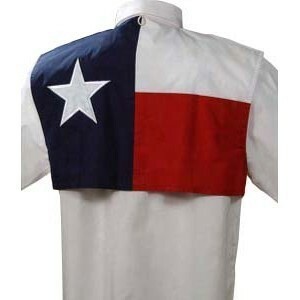 Texas Star applique on back. Stain and wrinkle resistant performance fabric. It has a right and left chest pocket and extra loops to carry all your fishing accessories, vented back allows air to circulate freely and enhance freedom of movement with Velcro closure and button tabs for that perfect casual look. Specially designed with the fisherman in mind and perfect for outdoors. Sizes XS-5XL.